Yes, you read that correctly. There is tequila in this jelly. Beware. Don’t let your clothes fall off. Actually, there are no worries because all of the alcohol boils away. My peppers were hiding under some weeds. After I pulled the weeds this morning, I realized I had a bounty of jalapenos, Santa Fe Grande yellow peppers, cherry peppers, and some pimentos. I scored a deal on some 4 oz. jelly jars and I love to give these to staff for holiday gifts. So far I have eleven of these little jars canned up with Orange-Grape Jam. 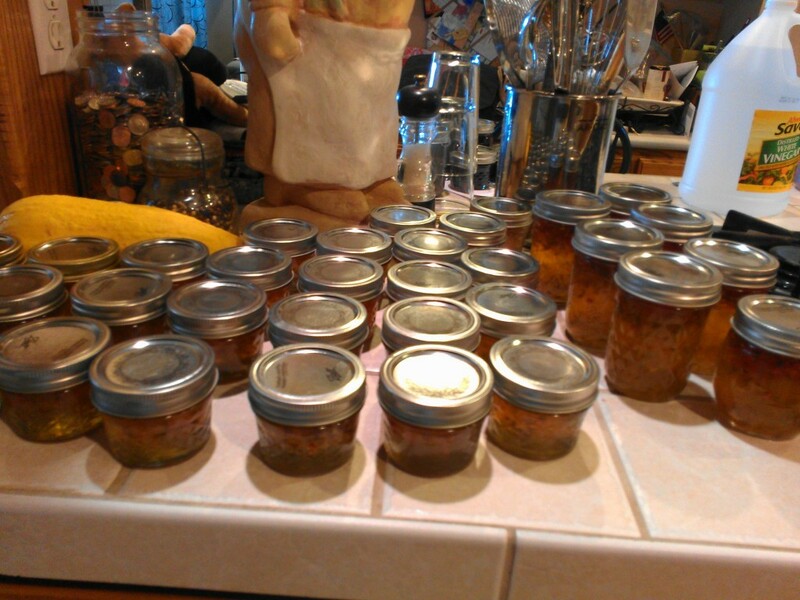 As of this evening, I have twenty-seven little jars of jalapeno-apricot jelly. And, I have seven half-pints of this experiment. Please be aware that this is truly an experiment. 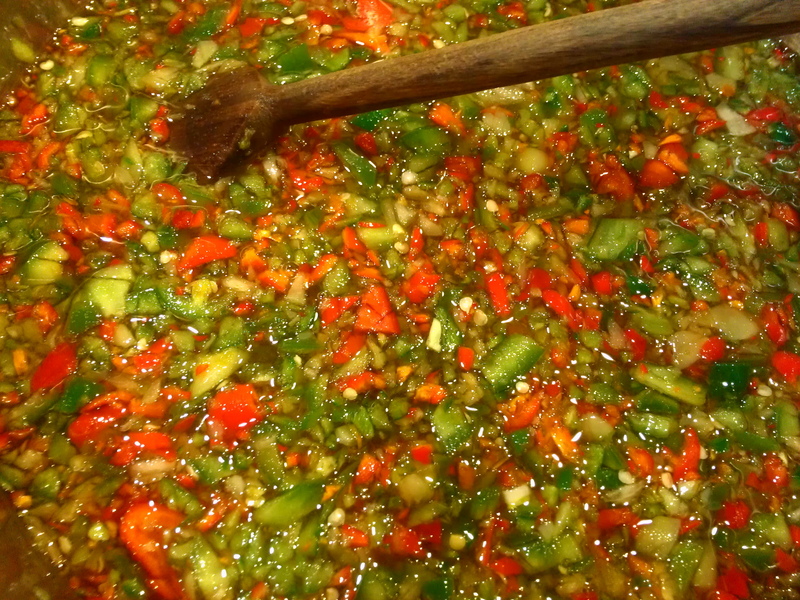 On my second batch of jalapeno-apricot jelly, I started dreaming of margaritas. (I think the heat in the kitchen had gotten to me.) Anyhoo, the next thing you know I decided to add some tequila to the final batch of the day. Seed jalapeno peppers before chopping if you don’t want a lot of heat in the jelly. I placed all the peppers in the food processor so I could get a fine chop. Bring mixture to a boil and boil rapidly for five minutes, stirring constantly. After five minutes, turn off heat and let jelly stand for 2 minutes. Ladle quickly into prepared jars (hot and sterilized), filling to within 1/8 inch of the top. Wipe rims and threads of jars. Cover with sterilized lids, screw bands tight, and place in a canner. Water bath for 10 minutes. Remove and let cool completely. 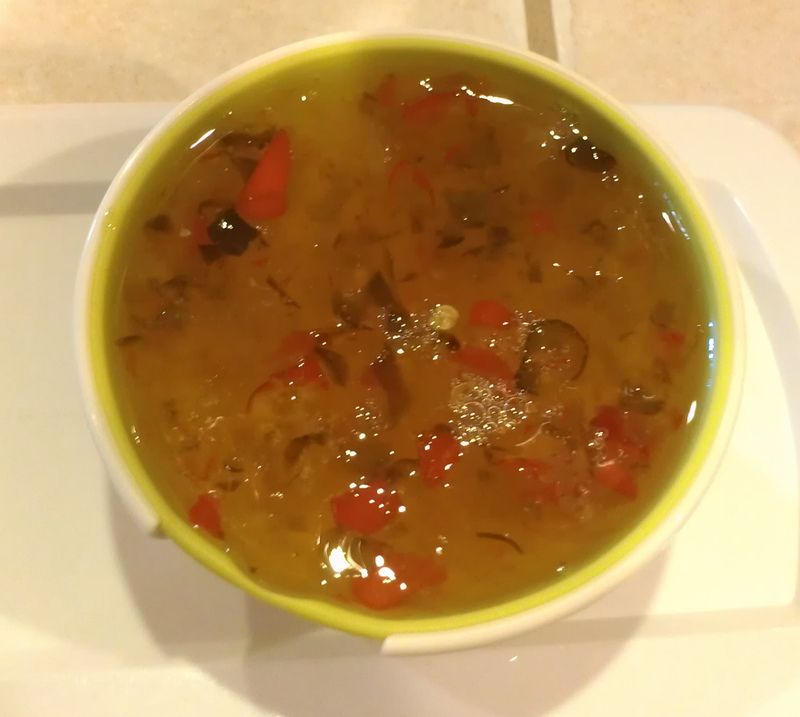 I used one green bell pepper, some jalapenos, some Santa Fe Grande peppers, and some pimentos in this mix. Mix and match as necessary. 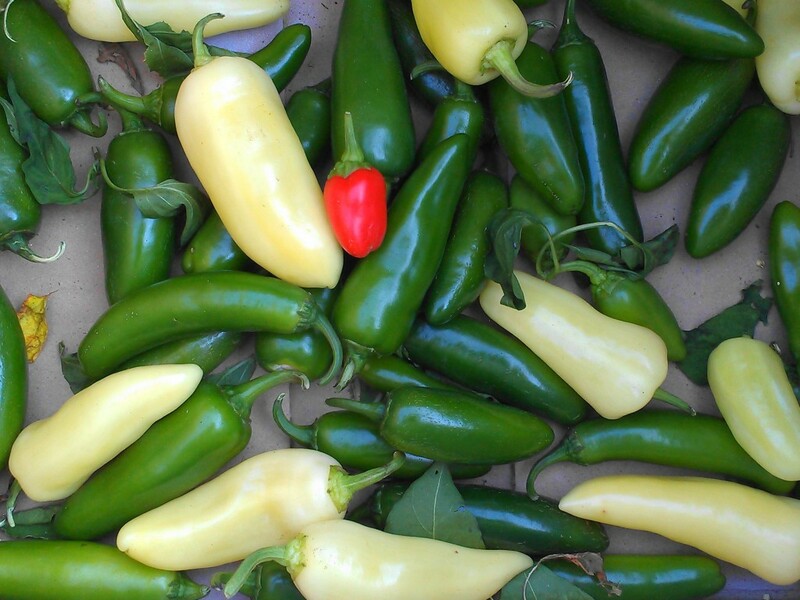 You could use jalapenos and a red and yellow bell pepper for a pretty color. If you have sensitive skin, wear rubber gloves while preparing peppers. Again, this is an experiment. I just went to check and it is still pretty runny but the leftover bit that I put in a bowl seems to be setting up. If this is a flop, I will post a retraction. 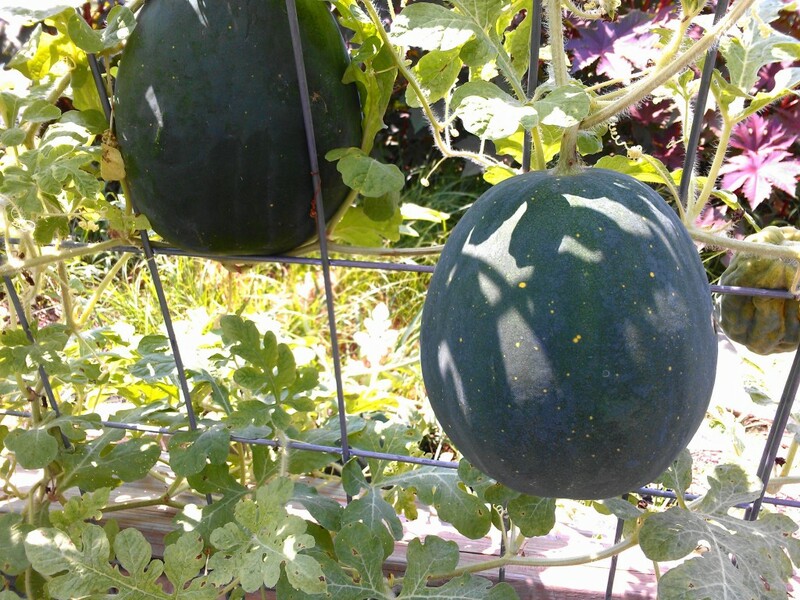 Abby, I don’t have a flower for you today but I do have some watermelons. Can you see the yellow star dots? Note: No retraction needed. It jelled up just fine and dandy. These are beautiful! I love cherry peppers – always have. Mom has some growing in her garden right now and she will can them for me later…………they are so great on hamburgers! Have you ever tried orange Jalapeno jelly? I haven’t either but it just sounded like a good combo as I was reading your post! 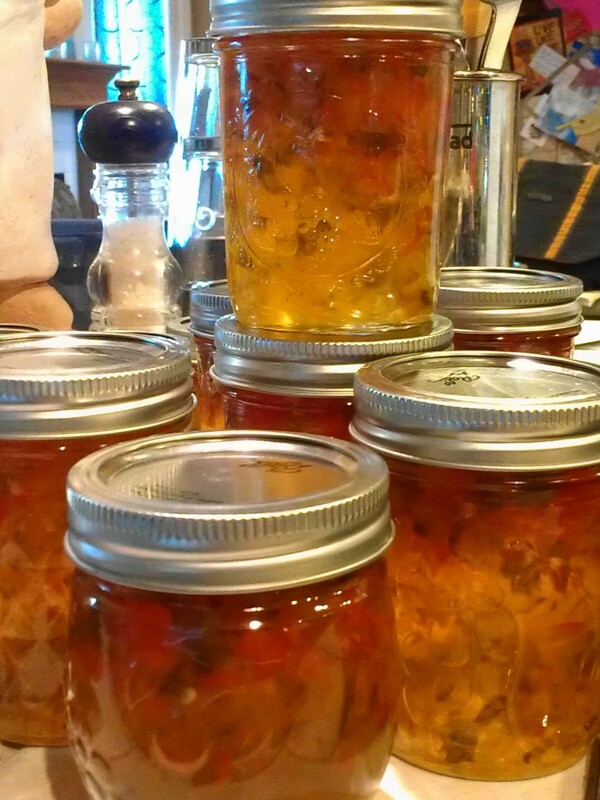 Lime from Christianne, Orange from Kelli….You guys should come over so we can have a jelly making party. Wow, want an interesting idea! I don’t think I’ve ever had tequila in a jelly before, but I’ll bet it blends well with the peppers. Very creative and fun – thanks. Still waiting for it to set up. I hope the tequila didn’t keep it from setting for some reason. Yeah!!! It set up!!!! And, I have tasted some. The tequila isn’t overwhelming but you can taste it. I adore hot pepper jelly. My Grandma used to make it and put a wax seal on top that you had to pop off before you dug in. I loved it on buttered toast. I’m feeling so sad now (Grandma passed away over ten years ago), I need to make this to cheer myself up! lol So did you taste it, and did you like it better with or without the tequila? I think it’s a cool idea! I think I recall adding rum to a batch of apple butter last year and I think I really liked it! I will love to give this as gifts just for the unique quality. My grandmother mad sand plum jelly with paraffin on top. I thought that was cool to pop the top too. PS I always thought melons (and other big produce, like pumpkins) were grown on the ground! What a trip to see them hanging! Gives us a bit more spice. wow you are a jam queen, Debra. The pepper jelly sounds amazing! I feel pooped out as MJ pointed out. Great idea for a jelly! I’d love this jelly on top of my homemade bread right from the oven! Did you ever try it with lime juice and if so… how did it taste? I haven’t but that is an idea.